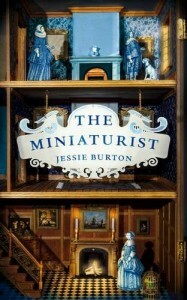 The early arrival of my new nephew delayed this review of Jessie Burton’s The Miniaturist. When I got the 5am call to baby-action I grabbed a handful of things enroute: spare pants, phone, wallet, house keys, and my copy of The Miniaturist. Come hell, high water, or a screaming baby I wasn’t going to miss out on what happened next. That’s how gripping this book is. The Miniaturist is the story of eighteen-year-old Nella Oortman, who arrives to start her new life as wife of successful merchant trader Johannes Brandt, in Amsterdam 1686. Her husband is not at her grand new home to greet her. Instead Nella encounters her sharp-tongued sister-in-law Marin. Things are off to a shaky start. When Nella enlists the help of a mysterious miniaturist to furnish Johannes’ wedding gift of a cabinet-sized replica of their house, dangerous secrets start to surface. Burton crams historical, visual and sensory detail into The Miniaturist. But far from leaden, her descriptions are as richly satisfying and as deftly executed as the sugar dusted treats that appear throughout the book. Seventeenth century Amsterdam is alive. But its the pace and suspense of The Miniaturist which really elevates it. Taut and heart-stopping on occasion, Nella grabs you by the hand and runs with you through her life. A staggering story, full of emotional punch, this book has wonderfully strong, brave, and complex female characters at its heart. Upon finishing I re-read the prologue, and it made me reconsider everything I’d just read afresh. A stupendous achievement. I don’t want to risk blurting out any spoilers, so I’ll just say: read this book, you won’t regret it.